Earlier this month I shared the chairs I worked on for Kirsten's room. Then we started working on the bookshelf. Hubby built a really nice big sturdy bookshelf to my exact specifications, and it's perfect. He made it out of pine since I intend to paint it white. 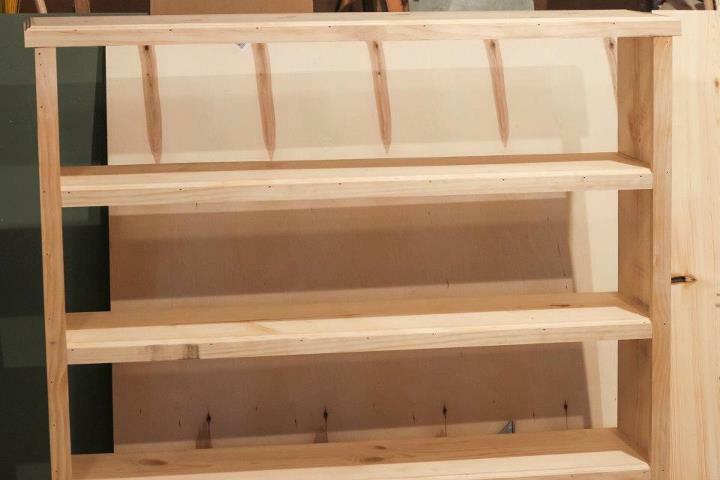 He put some nicer fronts on the shelves and a routed edge on the top. I got the back primed in the evenings, intending to do the shelves over the weekend. And then it got hot, like unbearable to work in the garage for 2 hours at a time even with the garage door wide open hot. So, he and I managed to get 1 coat of primer on it one Friday afternoon about 2 weeks ago, and it has sat like that since then. The back is done, but the shelves top and side still sit paintless. This weekend is supposed to be all thunderstorms, but today... today is beautiful. So, as soon as I get home this afternoon, I will be putting the 2nd coat of primer on it. Hopefully, if all goes well it will be in her bedroom before next weekend. I'm anxious to move more of her stuff into her room, so it will feel more like her room to her. We've been spending weekends at county fairs and the drive-in theatre and at birthday parties and a wedding. Enough fun though, I'm ready to get back to work and get her room finished up. I find myself getting overwhelmed in my projects, so my perfectionist shuts down... the heat doesn't help either!!! I can not wait to see the finished project!! It's coming along. Just a couple more coats!